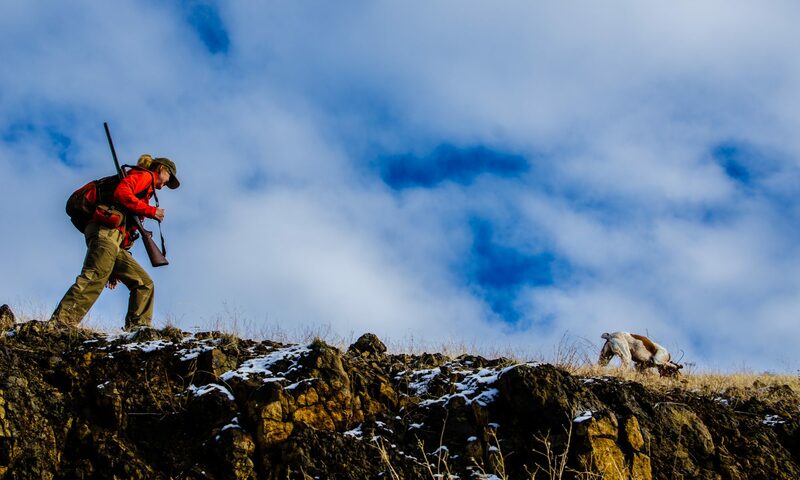 Chukar Culture: Birds or Bird Dogs? Sometimes potential ain’t all it’s cracked up to be. Right? Isn’t that the Billy Beane story line? Peat’s got tremendous potential, but can we survive him? That’s the latest question around here. Angus is sick of him. He’s wearing us out. But in the morning he’s the sweetest thing since evaporated milk, and he just wants to play (usually much too roughly) at all other times. Peat humps and batters Angus, and Angus has begun shaking in terror when Peat barks, which is often, and at ear-splitting volume. Lately, Angus retreats to the bedroom when Peat’s running around during playtime, and I shut the door. Last night was the first night in Angus’s life that he didn’t come sleep on the bed. I assume it’s because of Peat. I feel for the old dog (even though he’s only 8). Often I feel like an old dog. I am an old dog (although I’m younger than Angus in dog years). I wrote two emails this evening offering Peat to some people. I didn’t send them, but they’re ready to go. We work with Peat every day on basic obedience and retrieving, but it’s painful and painfully slow progress. Often I feel like Sisyphus. Our dogs are family members, pets, they sleep with us, they ride inside wherever we go, which is not how all hunting dog owners relate to their canine partners. But that’s how we roll, and Peat’s lopsiding our wheels more than we’re used to. More than we enjoy. This whole saga makes me feel like an idiot. I am an idiot. I wrote a post about that not too long ago. Still, we’ve had some great experiences with Peat, and we’ll still go no matter what happens with him. But in a way, he’s made me wonder which is bigger for me, chukar hunting or my bond with my dogs; they’re intimately connected, but it’s a question I’d never pondered until now. I’m not sure what I think about that. Anyway, here’s a little of what we’ve seen the past couple of weeks in our confusingly beautiful pastime. One of the things that I have learned from watching Marla with her group of labs is their personalities are so different it amazes me. Some will retrieve, some will hunt, some will be lovable, some are not. Some want to be with you, some want to go off on there own. Some want to please, some could care less. The true personalities do not always show up before the first year. They are all just pups. They are developing into who they will become, just like a kid. Who can predict a dogs behavior. Some are lucky in their choice of a pup, but not everyone. The old idea that a person needs to start with a pup is just wrong in my opinion. It is not possible to know the potential personality of a pup at 8 weeks. I have observed several people who have had dogs they have bonded with wind up with dogs that are much different than they anticipated. They wind up not really enjoying the life with their dog like you want to have with yours. It is hard to do, but in the end it will probably work best to help Pete find a home that is better suited for him than yours is. Marla really coaches people to find a suitable dog that is between one and two years old. They are always available from people in the breeding world. The breeder keeps a dog they think will work well in the show ring, but for whatever reason they don’t make the cut as they get about one to two years old. That does not mean they would not make a great hunter or a great friend. Basically her comment is, “Who ever feeds them and spends the most time with them will become their best friend. New bonds early on are not that hard to change.” Cut the ties now. It will work better for everyone in the end. Start contacting the breeder world to find a dog with the right personality to fit into your lifestyle. Look for a dog that has had lots of contact with people, understands basic rules of behavior, wants to retrieve and can get along with Angus. Take the dog for a month trial period so you will be able to return it if things don’t work out. You will know in a month if life is going to be acceptable with the new dog. To live for another decade with a dog that does not really fit is not a good choice. I hear you on this one. I go through similar thoughts sometimes. It’s tough when you have such good dogs to compare the new one too. They’re always trying to live up to the expectations you’ve created for them. The problem is, we tend to forget what we went through with our now more experienced dogs. I equate it to looking back at old girlfriends and how “awesome: they were. No… they kinda sucked (or I did), but looking back in hindsight it’s easy to remember just the good parts. I feel your pain! Im much younger, and probably much more stupid. I went through the same thing, and quite honestly I came really close to giving my young Brittany away. Heck I almost lost my temper to the point of doing the unthinkable after chasing her for who knows how many miles in the sandhills of NE. But I didn’t. Hopefully you wont either. Make sure to give Angus plenty of “you” time, and don’t give up on the little knucklehead. Two of the best Brittanies I ever had ( had 9 so far ) would not point until they were two years old. One was from the Williams Pride of Livingston, MT. line, from Ben himself. The other from Windy Ridge. I would consider running one dog at a time but I know that’s tough if you can only make one hike up and back. I would counsel patience and do not be afraid to judiciously use some electrical stimulation to control barking,pestering Angus (or you ) or other bad behavior. It won’t hurt Peat. He doesn’t even know what is causing it other than the bad behavior. Bob, when I first started out bird hunting I decided on getting a Brittany and purchased that puppy from Black Butte kennels in Eastern. Great blood lines etc. and they told me that the pup maybe a little Hot since the pup came from field trail stock. Beautiful dog, however, I could never get any control over him and the trainer that I sent him had no luck either. I finally gave up and sent the dog back to the kennel where he came from…..Ever since I have had GWP and have enjoyed each one. Good Luck with your decision. Thanks everyone for your thoughtful, kind comments. We’re not sure what we’re going to do. I’ll keep you posted. Bob don’t give up on Peat he is your opportunity to become a better dog man. You can learn so much by working with Peat remember he is still a puppy. I have had 12 dogs none of them the same some were hard headed, some were soft. I got a Britney from a friend who had a rough start he was 1 year old very soft he wouldn’t even get out of the truck when I got him. I had never worked with this type of dog it took me 1 year to turn him around. I learned so much in that year from working with him. He was an outstanding bird finder I would run him with my Pointers and he would find birds they would blow by. I lost Jake last year he was 9 and had kidney failure. I miss him. Don’t give up on Peat you may regret it. Bob, I love your blog. It’s the only blog I subscribe to and I read every one. Peat will get better, so don’t lose your sanity too soon. I have been following you all season because my hunting dog passed away unexpectedly last February. I still have a 15 year old former hunter in the house. I have been “living” vicariously through your post. Training a new dog can be a pain, but it will all be worth it. Hang in there! Keep the post coming! Bob, I love your blog, too, and while I’ve got no dog advice to give, I did want to mention that the scenery in your video is incredibly beautiful. nice job on the editing, too. It was a feast for the eyes and the ears. I miss you two! Coming from someone whose impeccable taste betters mine, Sarah, thank you for the choice compliment. We miss you, too. Fly safely.